Ron “Fang” Mitchell cast a broad shadow over the basketball landscape at Coppin State College, a small inner city school on North Avenue in Baltimore, Maryland. Founded in 1900 as the Colored High School (later named Douglass High School) on Pennsylvania Avenue, it begin as a one-year training course to train elementary school teachers and by 1902, the training program was expanded to a two-year high school, and in 1926, was named the Fanny Jackson Coppin Normal School in honor of the outstanding African-American woman who was a pioneer in teacher education. (Fanny Jackson Coppin was born a slave in Washington, DC and after she gained her freedom, graduated from Oberlin College in Ohio, and founded the Philadelphia Institute that was the forerunner of Cheyney State University). By 1938, the school became a four-year institution, granting Bachelor of Science degrees, and the name of the Normal School was changed to Coppin Teachers College. In 1950, Coppin became part of the higher education system of Maryland under the State Department of Education, and renamed Coppin State Teachers College. Two years later, Coppin moved to its present 38-acre site on West North Avenue. Mitchell was born in Philadelphia, Pennsylvania and was raised in Camden, New Jersey where he graduated from Woodrow Wilson High School. Unable to afford college tuition, Mitchell worked his way through college- attending Gloucester County College and playing on the basketball team. He attended Rutgers University–Camden for a year while working as a shoe company manager and printing sales representative. He opened his own clothing store (Mr. Fang’s Athletic Attire) in Glassboro, New Jersey, and became so successful he expanded from one to three locations. 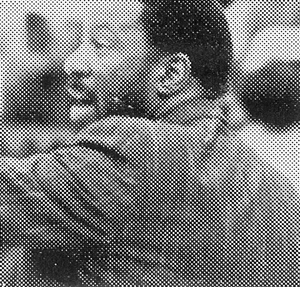 In 1978, despite no coaching experience, Mitchell became head coach at Gloucester County College and led the previously struggling Gloucester County Roadrunners to a 19–11 record his first season. They went on to have consecutive seasons with 26 or more wins per year until the 1985–86 season and the Roadrunners made the NJCAA Tournament in 1980, 1981, 1985, and 1986. While coaching the GCC team, Mitchell became a good friend of Temple coach John Chaney and assisted at Temple University basketball camps. He also found time to complete his Bachelor of Business Administration degree at Thomas Edison State College in 1984. In 1986, Coppin State had acquired University status and was a member of the Mid-Eastern Athletic Conference (MEAC). They hired Mitchell to be head coach for the Coppin State Eagles men’s basketball team- a position he would hold for the next 28 seasons and was named MEAC Coach of the Year six times. He led the Eagles to ten first place finishes in the MEAC regular season standings and onto four NCAA Tournament appearances. The Eagles improved annually from 8–19 in Mitchell’s first season to 26–7 in the 1989–90 season and a berth in the 1990 NCAA Tournament. The season also included an upset over Maryland. Coppin State finished the 1993 season with a 22–8 record and first in the MEAC and a bid to the 1993 NCAA Tournament. Coppin State made the NCAA Tournament in 1997 as a #15 seed and upset #2 South Carolina in the first round before losing to Texas in the second round 82–81. Mitchell would lead Coppin State to it’s last NCAA Tournament berth in 2008. In 2014, Mitchell’s tenure at Coppin State ended after a decade long losing streak.